“Tom has completely redesigned our website so it is responsive to all mobile devices, very user friendly with a modern and effective design. He understood our requirements and produced some excellent logos and branding ideas as well. As a result, we now have a stylish, original and professional looking website which is easy to navigate, with logo and profile designs that we can use in our branding and social media. “Tom has created us a great logo and identity. 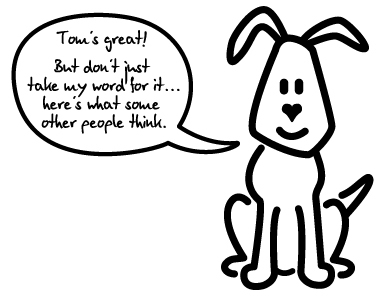 We are very impressed by how quickly Tom understood our brief, and responded to feedback so promptly and accurately. Also really appreciated being presented with options at every step of the way with sound advice and guidance offered. Tom provided an efficient, cutting edge performance for our Company. The web-site was perfectly constructed and has received a lot of favourable comments. Tom’s other professional attributes were his design depth and colourful advertising ideas which were also extremely accurate for our client niche. “Working with Tom was incredibly easy. He lent his expertise to my initial ideas effortlessly to bring my brief perfectly to fruition. “Tom listened to our needs and helped us explore new dimensions. He always related well to our team and his creativity helped bring about very pleasing outcomes. The work was impressive, realistic and creative. He listened to our thoughts, whilst helping us to keep a firm hold of our aims as we explored opportunities together. We are delighted with the results! I discovered your blog website on google and check some of your early posts. Continue to keep up the extremely very good operate. I just extra up your RSS feed to my MSN News Reader. Searching for forward to reading more from you later on!